This form has palmate leaves that are purplish-bronze tinged when young and bright red-pink flowers which age to crimson seed pods. The leaves sometimes have fewer leaflets than the species. 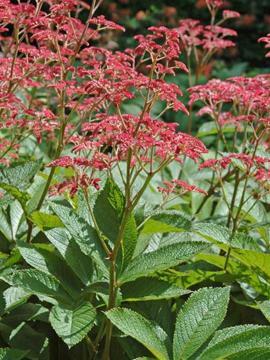 Moist, but not waterlogged, humus-rich soil in full sun or part shade. Will not tolerate dry conditions. Very suited for growing near water or in the bog garden.